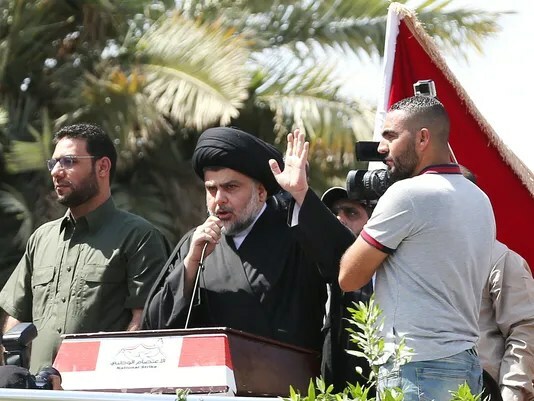 For the first time in years, the Iraqi Shiite cleric Muqtada al Sadr and his militia are unleashing fiery anti-American rhetoric and threatening to attack U.S. troops. But top U.S. military officials have downplayed his remarks, saying that for now there’s no cause for concern. Sadr rose to prominence when his Mahdi Army battled U.S. troops after the 2003 invasion. He has quietly tolerated the comparatively small U.S. military force there now supporting the war on Islamic State extremists. But the powerful cleric became confrontational again after Defense Secretary Ash Carter announced plans on July 11 to send an additional 560 U.S. troops to Iraq, bringing the total to more than 4,600. “They are a target for us,” Sadr said in a post on his official website on July 17. A few days later, an official spokesman for Sadr’s militia, Alaa Abboud, echoed the threat. “We are thirsty for Americans’ blood,” Abboud told a prominent Iraqi television news channel. Any attacks by Sadr’s militia would fundamentally change the Pentagon’s view of its mission to defeat the Sunni-led Islamic State group, also known as ISIS or ISIL. If U.S. forces were faced with a violent enemy inside Shiite-controlled territory, where many American troops are based, the heightened risk could prompt senior commanders to rethink their strategy or bring some troops home. China’s military cooperation with Pakistan will involve bolstering the Pakistani navy next, an expert on China-Pakistan relations said on Friday, pointing to Pakistan’s planned acquisition of eight submarines from China as one of the “biggest and most significant” markers of their relationship. “China will continue to bolster Pakistan’s military, and the navy is clearly the next phase of this,” Andrew Small, author of the “China-Pakistan axis: Asia’s new geopolitics” told The Hindu, adding the move would be driven by China’s increasing commitment to the economic corridor running from Xinjiang to Pakistan’s Gwadar port. In October 2015, Pakistan had announced its decision to acquire eight Type 41 Yuan-class diesel-electric submarines, half of which may be built in Pakistan while the other half would be made in China and transferred. “Asia Pacific peace weighs more heavily for the Chinese leadership, intrinsically, at the moment. You have the pattern of submarines in Sri Lanka, Maldives, and in Pakistan and I think they expect to be able to expand their presence in the Indian Ocean, but they are substantially weaker there. The Indians and the Americans are in a substantially stronger position there,” Mr. Small said. Ties between India and China have been under a strain for several reasons, including the economic corridor that India has objected to as it traverses through Pakistan-occupied Kashmir. On China’s opposition to India’s Nuclear Suppliers Group membership, Mr. Small believes Beijing will continue to stick to its stand that India’s membership was contingent on a “process”. However, he added that if a process would allow India to become a member later this year and would open a door for Pakistan, it would be a “harder call” for China to hold out. INU – A prominent European politician has criticised the Iran nuclear deal for numerous flaws and say that the West must not allow the mullah’s regime to flout the terms of the deal. Struan Stevenson, the President of the European Iraqi Freedom Association (EIFA), wrote an op-ed piece for The Diplomat in which he asked whether the deal would collapse under mounting tension regarding uncovered flaws. The Iran nuclear deal, officially known as the Joint Comprehensive Plan of Action (JCPOA), was signed in July 2015 and was celebrated as a foreign policy breakthrough by Western governments but a lot of the terms and conditions were secret; only now being revealed. The Associated Press published a leaked document which showed that Iran would be able to enrich uranium again in 2026, rather than 2030 as previously reported. The regime reacted angrily claiming that the leak violated the deal and the President of the Atomic Energy Organization of Iran (AEOI) Dr. Ali Akbar Salehi said that this leak will permit Iran to enrich uranium at a higher capacity than before the agreement was made. He pointed out the Natanz was only revealed to the West by the opposition group, the People’s Mojahedin of Iran (PMOI); Iran had been keeping it secret. If they kept Natanz secret, how can we trust that they aren’t keeping another site secret? Iran’s excessive call for retaliation against the West cannot be overlooked; Russia has delivered S-300 surface-to-air missile systems to them and North Korean missile experts have visited them. Despite drawing criticism from UN Secretary General Ban Ki-moon launching nuclear tests in violation of the deal, Iran has not stopped. In fact, Iran threatened to tear up the nuclear pact. Stevenson recommended that the US monitor the situation closely and adopt tough measures where necessary. Even if confined to South and Central Asia, a nuclear war would have devastating consequences to the world. But, when it comes to a nuclear attack on New York, the source is much less unlikely (or marginally more likely) to be Islamist extremists than Russia. Thus when President Obama states that he’s more concerned with a nuclear strike on Manhattan, he’s actually speaking about a Russian attack without necessarily realizing it. In the same vein, if President Putin voiced similar concerns about Moscow, the source of a nuclear attack is much less likely to be Islamist extremists than the United States. In other words, nuclear war remains the domain of the superpowers. Russ Wellen edits the Foreign Policy in Focus blog Focal Points for the Institute of Policy Studies. A student of the metaphysics of nuclear weapons, he has written about disarmament for a variety of publications such as AlterNet, Asia Times Online, Bulletin of the Atomic Scientists, the Journal of Psychohistory, and Truthout. Originally published in Foreign Policy in Focus under a Creative Commons Attribution 3.0 License. In this May 10, 2016, photo, North Korea’s leader Kim Jong Un watches a parade from a balcony at the Kim Il Sung Square in Pyongyang. © (AP Photo/Wong Maye-E) In this May 10, 2016, photo, North Korea’s leader Kim Jong Un watches a parade from a balcony at the Kim Il Sung Square in Pyongyang. PYONGYANG, North Korea (AP) — North Korea’s top diplomat for U.S. affairs told The Associated Press on Thursday that Washington “crossed the red line” and effectively declared war by putting leader Kim Jong Un on its list of sanctioned individuals, and said a vicious showdown could erupt if the U.S. and South Korea hold annual war games as planned next month. Whoever is elected on Nov. 8 will be a war president on day one, with the power and autonomy to undertake destabilizing shows of force, drone strikes, special operations raids and ever-deepening military interventions. Today, combat troop deployments are routinely made by executive branch spokespeople, decisions to back open-ended air wars in places like Yemen by “partners” like Saudi Arabia are announced via press release, and congressional oversight hearings largely boil down to legislators pleading with commanders to ask for more troops and looser rules of engagement.And much of this probably suits Hillary Clinton just fine. Unlike Donald Trump, who has wildly shifting positions and alleged “secret” plans to defeat the Islamic State, Clinton has an extensive track record upon which one can evaluate her likely positions. By any reasonable measure, Clinton qualifies as a hawk, if a nuanced one. Though she has opposed uses of force that she believed were a bad idea, she has consistently endorsed starting new wars and expanding others.Consider seven prominent situations in which she has had to decide whether to support the use of American military force:Haiti: In 1994, Clinton opposed intervening in Haiti to reinstate the Jean-Bertrand Aristide government. As historian Taylor Branch recounted in his diary of interviews with Bill Clinton: “I asked him what Hillary thought. He said the pell-mell rush to invade was crazy to her. Reacting against the pressure, the lack of options, and his sense of being trapped, she said he was badly served by his foreign policy staff.” This was an astute judgment by the then-first lady, as the options developed by the U.S. Southern Command and Joint Chiefs were poorly conceived and often logistically impossible to carry out. Fortunately, a 25,000 U.S. troop invasion was avoided after Jimmy Carter brokered a last-minute agreement with Raoul Cédras that assured he would step down from power. Iraq: In 2002, as a senator for New York, Clinton voted for the authorization for the use of military force in Iraq. In her accompanying floor statement, she claimed it was to ensure President George W. Bush was “in the strongest possible position to lead our country in the United Nations or in war” and to show Saddam Hussein that the country was united. After initially defending the vote, she later adjusted, variously declaring she “thought it was a vote to put inspectors back in,” it was “based on the facts and assurances that I had at the time,” and ultimately “it was a mistake to trust Bush.” Clinton also justified the 2002 vote as simply one for compelling compliance, proclaiming, “I believe in coercive diplomacy,” in a January 2008 presidential debate. Regardless of the reasons or excuses behind her vote, the Iraq War was a foreign-policy and geopolitical disaster.Pakistan: In 2007 and 2008, Clinton strongly disagreed with then-Sen. Barack Obama about striking al Qaeda targets inside of Pakistan. Obama called such attacks “just common sense” if there were “actionable intelligence.” Clinton referred to the 1998 cruise missile strikes in Afghanistan that failed to kill Osama bin Laden and warned that “we have to be very conscious of all the consequences,” particularly anything that would destabilize Pakistan’s nuclear arsenal. Obama would go on to authorize 407 drone strikes in Pakistan, killing 3,089 people. Nearly 300 of these occurred while Clinton was secretary of state, during which time U.S. diplomats opposed only one or two of the strikes. Whatever hesitation Clinton once had in attacking militants in Pakistan vanished upon being confirmed as secretary of state. Syria: In 2012, she reportedly proposed to the White House — along with CIA Director David Petraeus — a covert program (apparently larger than the one later authorized) to provide arms to vetted Syrian rebel groups fighting Bashar al-Assad’s government. Obama opposed this proposal on the grounds that there could be no guarantees of where the weapons would ultimately end up and that CIA analysts determined they would not have “materially” hastened the removal of Assad from power. It is difficult to assess the CIA-led train-and-equip program’s effectiveness, compared to larger Defense Department-led efforts, but there remains no collection of U.S.-backed rebel groups that has threatened the existence of the Assad government, which is now backed by indiscriminate Russian air power.Outside of specific interventions, Clinton also supported muscular shows of force as secretary of state. New York Times reporter Mark Landler describes a July 2010 White House debate about rerouting the USS George Washington aircraft carrier from its normal cruise into the Yellow Sea. Adm. Robert Willard, the head of U.S. Pacific Command; Adm. Mike Mullen, the chairman of the Joint Chiefs; and Secretary of Defense Gates all agreed on this aggressive maneuver. “Clinton strongly seconded it. ‘We’ve got to run it up the gut!’ she had said to her aides a few days earlier,” Landler writes. But Obama refused the request, declaring, “I don’t call audibles with aircraft carriers.” It bears noting that determining the aggressiveness by which the United States conducts freedom of navigation operations in maritime waters claimed by China will be a consequential call for the next president.Finally, Clinton has had an unusual exposure to the military from multiple civilian positions, which may make her far better prepared to serve as commander in chief than her husband was in 1993, when he had a notoriously difficult start leading the military. As first lady, Clinton was routinely exposed to military intervention debates among senior officials, including over Haiti, Bosnia, and Afghanistan, and later served six years on the Senate Armed Services Committee and four as secretary of state. She also has developed close relations with retired military officers like Gen. Jack Keane, who has rarely seen a country that cannot be improved with U.S. ground troops and airstrikes. As Bob Woodward wrote of a 2009 meeting between the two to discuss the Afghan surge: “Clinton greeted Keane with a bear hug, astonishing [U.S. envoy for Afghanistan and Pakistan Richard] Holbrooke because—and he should know—Hillary rarely bear-hugged anyone.”I have spoken about Clinton with a handful of military officers, then stationed in Islamabad and Kabul, who were routinely involved in video teleconferences with her as secretary of state. They all described her as being, by far, the best-prepared senior participant in meetings and having read all the memos or briefing books that were sent as preparatory material. They relayed that Clinton has an intimate understanding of military doctrine, Pentagon acronyms, and military planning principles and was not afraid to press senior commanders to clarify the “courses of action” and the intended “end state” of any given military intervention. Embracing his former rival to thunderous applause from the convention hall, Obama thus passed the Democratic party’s baton to the first woman ever nominated for president by a major American political party. President Obama and Hillary Clinton on stage during the 2016 Democratic National Convention at Wells Fargo Center. Of that unfinished work, nothing is more important than national security. And there, he argued that no candidate was more prepared than his former secretary of state and first lady to President Bill Clinton. “No one. Not me, not Bill, not nobody,” he said. “I know Hillary won’t relent until ISIL is destroyed. She’ll finish the job – and she’ll do it without resorting to torture, or banning entire religions from entering our country. She is fit to be the next commander in chief,” Obama said. Obama’s enthusiastic endorsement anchored a Wednesday night lineup that also featured Vice President Biden and his would-be successor, Virginia Sen. Tim Kaine. Echoing a theme throughout the convention, they all spoke of the Clinton they know personally — as opposed to the cartoon version she’s portrayed as by her Republican critics. Obama’s prime-time speech in Philadelphia capped a 12-year career in national politics as he attempts to pass the baton to the former first lady and senator from New York. Twelve years ago to the day, a then-unknown state senator from Illinois took to the convention stage in Boston to declare a “politics of hope,” laying the groundwork for his own 2008 election to the White House. “The America I know is full of courage, and optimism, and ingenuity. The America I know is decent and generous,” he said. He even quoted Ronald Reagan, calling America “a shining city on a hill,” and contrasted it with Trump’s pessimism. When the crowd booed, he repeated a line that’s become a staple of his stump speeches. “Don’t boo. Vote,” he said. TEHRAN (Tasnim) – Iraq’s Ambassador to Tehran Rajeh Saber Abboud al-Mousavi slammed recent protests held in Baghdad calling for economic and political reforms, and said they do not represent the will of all Iraqi people. Mousavi said in an interview with the Tasnim News Agency, referring to rallies held in Baghdad and Basra. The Iraqi diplomat went on to say that if anyone is seeking a change in the government, they should do this through elections. On Friday, hundreds of people staged a rally in central Baghdad, demanding formation of a technocrat government and prosecution of corrupt officials, according to media reports. Also in Basra, some 550 km to the south, dozens of protesters held a protest outside the Provincial Council building, demanding abolition of the sectarian quota system and a major campaign against corruption. They also demanded that seven ministers who resigned recently under pressure are held accountable for the decisions they made during their terms in office.